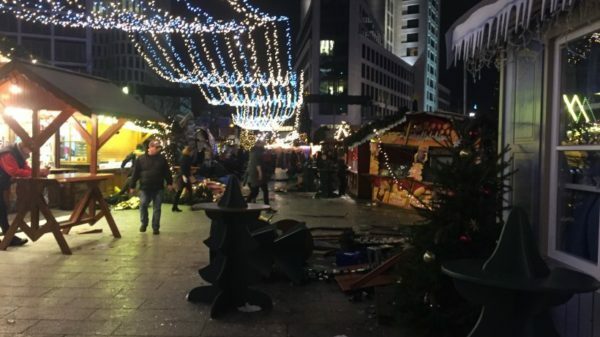 A “probable terrorist attack” is being investigated in Germany after a man ploughed a truck into a Christmas market in the heart of Berlin, killing 12 people and injuring 48. German police have detained the driver, who security sources reportedly say is an Afghan or Pakistani asylum seeker. The man arrived in Germany in February as a refugee, the DPA news agency said. According to the Tagesspiegel, he was known to the police for minor crimes, but not terror links. German politicians had avoided branding the bloodshed a terror attack in the hours immediately following, but Interior Minister Thomas de Maiziere told ARD television, “there are many things pointing to one”. The Christmas market is at Breitscheidplatz, close to the Kurfuerstendamm, the main shopping street in Berlin’s west. The crash happened in the shadow of the Kaiser Wilhelm Memorial Church, which was damaged in a World War Two bombing raid and preserved as a symbol of peace. The truck, which was loaded with steel beams, veered into the market at 20:14 local time,one of its busiest times. It crashed through wooden huts and stands packed with tourists and locals. The truck driver was reportedly seized after leaving his truck and fleeing on foot. Berlin police spokesman Winfried Wenzel told die Welt that the man ran down the street towards the Tiergarten, a large public park. A witness followed him at a distance for more than a mile, and called the police, who quickly detained him near the Victory Column monument. The police spokesman speculated that the driver may have wanted to “find shelter in the darkness of the park”. According to German media, the suspect was from Afghanistan or Pakistan and had entered the country as a refugee in the past year. Police confirmed that a passenger was found dead in the truck, and said he was a Polish national. There are fears he may have been the original driver of the vehicle, and that he was subject to a hijacking. Ariel Zurawski, the Polish owner of the truck, confirmed that his driver was missing and had been unreachable since 16:00 on December 19. “We don’t know what happened to him,” he told the AFP. The truck was registered in Poland and police said it was believed to have been stolen from a building site there, the AP reports. Both ISIS and al-Qaeda have urged their followers to use trucks as a means to attack crowds. The US labeled the tragedy an apparent “terrorist attack” and pledged its support. President-elect Donald Trump blamed “Islamist terrorists” for a “slaughter” of Christians in Berlin.